Current industrial agricultural practices produce a tradeoff between agricultural production and the quality of coastal ecosystems, because agricultural fertilizers that increase crop yields lead to the creation of low oxygen hypoxic areas in areas which receive a lot of nutrient rich runoff. The World Resources Institute and Virginia Institute of Marine Science, has updated Diaz et al’s recent map of coastal eutrophication. They identify 169 hypoxic areas, 233 areas of concern, and 13 systems in recovery. (1) Documented hypoxic areas – Areas with scientific evidence that hypoxia was caused, at least in part, by an overabundance of nitrogen and phosphorus. Hypoxic areas have oxygen levels low enough to inhibit the existence of marine life. (2) Areas of concern – Systems that exhibit effects of eutrophication, including elevated nitrogen and phosphorus levels, elevated chlorophyll levels, harmful algal blooms, changes in the benthic community, damage to coral reefs, and fish kills. These systems are impaired by nutrients and are possibly at risk of developing hypoxia. Some of the systems may already be experiencing hypoxia, but lack conclusive scientific evidence of the condition. (3) Systems in recovery – Areas that once exhibited low dissolved oxygen levels and hypoxia, but are now improving. For example, the Black Sea recovery is largely due to the economic collapse of Eastern Europe in the 1990s, which greatly reduced fertilizer use. Others, like Boston Harbor in the United States and the Mersey Estuary in the United Kingdom also have improved water quality resulting from better industrial and wastewater controls. 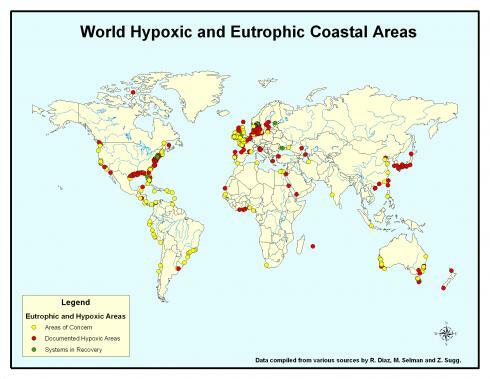 Given the state of global data, the actual number of eutrophic and hypoxic areas around the world is likely to be greater than the 415 listed here. The most under-represented region is Asia. Asia has relatively few documented eutrophic and hypoxic areas despite large increases in intensive farming methods, industrial development, and population growth over the past 20 years. Africa, South America, and the Caribbean also have few reliable sources of coastal water quality data. A more detailed analysis of this data set will be available in February 2008 in a policy note entitled Eutrophication and Hypoxia in Coastal Areas: A Global Assessment of the State of Knowledge (a list of related publications can be found here. USGS just released a new report documenting how nine states in the Mississippi River Basin contribute the majority of nutrients to the Northern Gulf of Mexico leading to hypoxic conditions. Thanks for posting this. There’s at least one odd spot on the new map: is there really a documented case of hypoxia driven by anthropogenic nutrient loading between Somerset Island and Cornwallis Island in Nunavut, the Canadian Arctic? The only nearby community is Resolute, with a population of at most 250 people. Hi Simon, you’re right that’s a weird place of hypoxia. I’ll provide an update when the report comes out.